Woods Drinkwater, a 2007 graduate of Loyola University New Orleans College of Music and Fine Arts, recently received a Grammy Award for his engineering work on the album, “BeauSoleil & Michael Doucet: Live at the 2008 New Orleans Jazz & Heritage Festival.” The album won a Grammy for Best Zydeco or Cajun Music Album for 2008. Drinkwater began volunteering at Jazz Fest in 2005 through a connection with Loyola instructor and CMFA coordinator of technology Jay Crutti. Over the years, he went from being a volunteer to production manager for Jazz Fest Live, which records, mixes and sells concert recordings from the New Orleans Jazz & Heritage Festival. 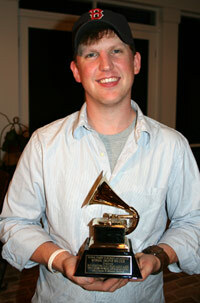 As the production manager, Drinkwater is responsible for personnel, equipment and many of the recording mixes. Since graduating from Loyola, Drinkwater has traveled with the Allman Brothers Band, recording their live concerts. He is also occasionally working at the New Orleans music studio, Music Shed, and traveling as tour manager and front-of-house engineer for the band, MyNameIsJohnMichael. For more information on the College of Music and Fine Arts, contact Sean Snyder in Loyola’s Office of Public Affairs at smsnyder@loyno.edu or call 504-861-5882.